What is my ‘download speed’? How about my ‘upload speed’? And what in the world is ‘network latency’? Have you heard other people throwing these words around and wondered what in the world they meant and how it would affect you? Don’t worry! In this article we will explain these terms and how they could affect you and help you make smarter decision when it comes to choosing your providers. What is internet speed and how is it measured? Internet speed is measured by the amount of numerical data (bits) transmitted or received in a unit of time (a second). It is expressed most usually in bit per second and is composed of download speed and upload speed. Internet speed is also affected by network latency. Download speed refers to the speed at which your computer receives the data coming in from the internet. Incoming data is what enables you, for example, to open a web page, to sync and open e-mails and download files or to stream content online. 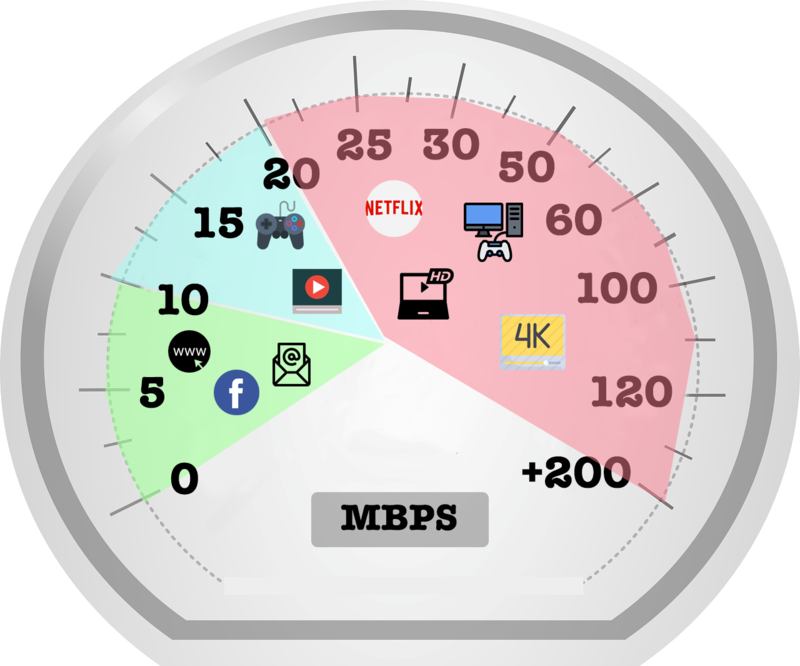 The download speed of your internet connection determines how long it typically takes you to do each of these things or how long your video takes to buffer. Upload Speed refers to the opposite, i.e. the speed at which your computer is able to send data to or via the internet. Outgoing data is what helps you, for example, to send emails, upload or attach files to emails or other cloud platforms and upload videos etc. The upload speed of your internet connection therefore determines how long it would typically take you to attach a file and send an email etc. Latency – Data packets on the internet move between many computers and equipment (for e.g waiters and routers) en route from the input source to the destination, and each one of these equipments takes a few milliseconds to answer and communicate between themselves. The latency of your connection is the sum of all these times. Many factors affect latency – such as medium of transmission (whether optical fiber or wireless – each introduces a delay), the size of the packet, your router and other processing gateways and lastly, the age and speed of your own computer. Check that any VoIP telephone connections that you may have are not running at the moment. Now that you have tested your internet speed, how do you judge if it is good enough? What factors can affect your internet speed and how do you choose the best speed and best provider for your needs? Do you know that internet speeds can differ based on the kind of your connection? Whether you choose a cable connection vs Optical Fiber connection can make a difference to your internet speeds. 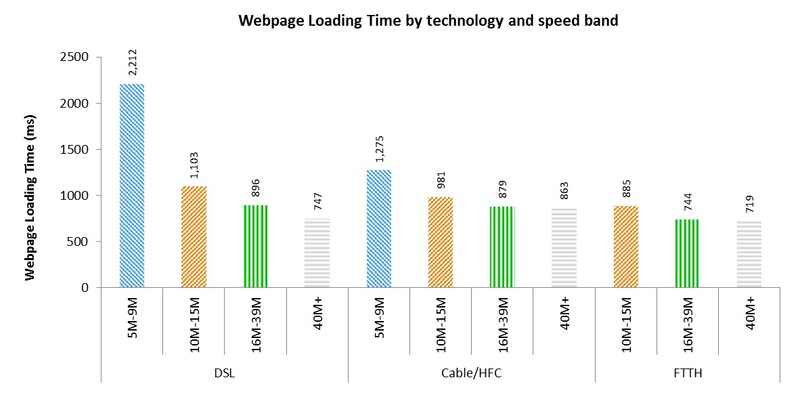 A CRTC evaluation of broadband speeds indicates that on average a website takes approximately 0.7 seconds with optical fiber, 0.9 seconds with HFC cable and 1.3 seconds with a LAN connection. So if speed is important for you, then an optical fiber connection might be your best bet. A number of devices utilizing the same connection at the same time. If you suspect that the number of connected devices is to blame, try disconnecting unused devices. But if that isn’t the issue and it is the strength of your wifi connection that is to blame, or you suspect your router might be old or faulty, call your internet service provider. In most cases, they should be able to fix the issue for you free of charge if you are testing for speeds lower than what you are paying for. If however, they ask you to upgrade to a pricier plan, be sure to shop around for the best deals for your money and your needs, before you upgrade. And the best place to check for all available plans and providers and compare prices, is Planhub.ca. For people who are light users of the internet and whose main usage is limited to checking emails and browsing online, internet speeds ranging between 4-6 MBPS is likely to be sufficient. However, for most of us in this day and age, restricting ourselves to just browsing and email is close to impossible. Most social media sites such as Facebook and Instagram as well as most news and content websites have videos that stream automatically and we would all want those videos to stream seamlessly. Plus with the popularity of YouTube and Spotify, Netflix and Hulu etc, a minimum speed of 10 MBPS is essential. But if several people or devices are using this 10 mbps connection, you will again notice a decrease in speeds. For using multiple devices simultaneously or to play online video games, stream online content etc, internet speeds from 15 to 20 MBPS is ideal and powerful. If however, you are a serious gamer or you wish to utilize the extreme HD, 4K etc streaming capacities of Netflix etc, then we recommend an internet plan that offer speeds of at least 30MBPS. Again, if multiple users will be streaming 4K or extreme HD content or playing online games simultaneously, we recommend that you opt for plans that offer between 30 – 50 MBPS. Find your ideal internet plan for the best price on Planhub.ca or simply message us on facebook, where our chatbot or one of our staff members will help you find the best internet plan for your needs.